Where to find all nineteen Rubber Duckies across Fortnite's map. Our Fortnite Rubber Duckies locations guide contains a list of all the Rubber Duckies locations to help you complete this Week 3 Challenge. Last Season Fortnite challenged players with finding a number of Hidden Gnomes across the map. Turns out that we’ll have to seek out another collectible this time around. We’ve gone from little gnomes, to rubber duckies - naturally. It's a very tall order for players, as these Rubber Duckies are pretty minute, while Fortnite's map is vast and intricate. They could be anywhere, which means that it's largely down to luck if you want to find them. Unless of course you're willing to spend match after match scouring the entire map for them. Thankfully you won't have to, as members of the community have done the hard work for us and stripped away all the challenge. We've put together a guide that contains a list of all the places you'll find these Rubber Duckies across the map, as well as a video resource by DooM Clan which'll showcase where they are in even greater detail. If you find that we've missed a location out, do make sure you let us know in the comments section below as we'll definitely feature it in the article! 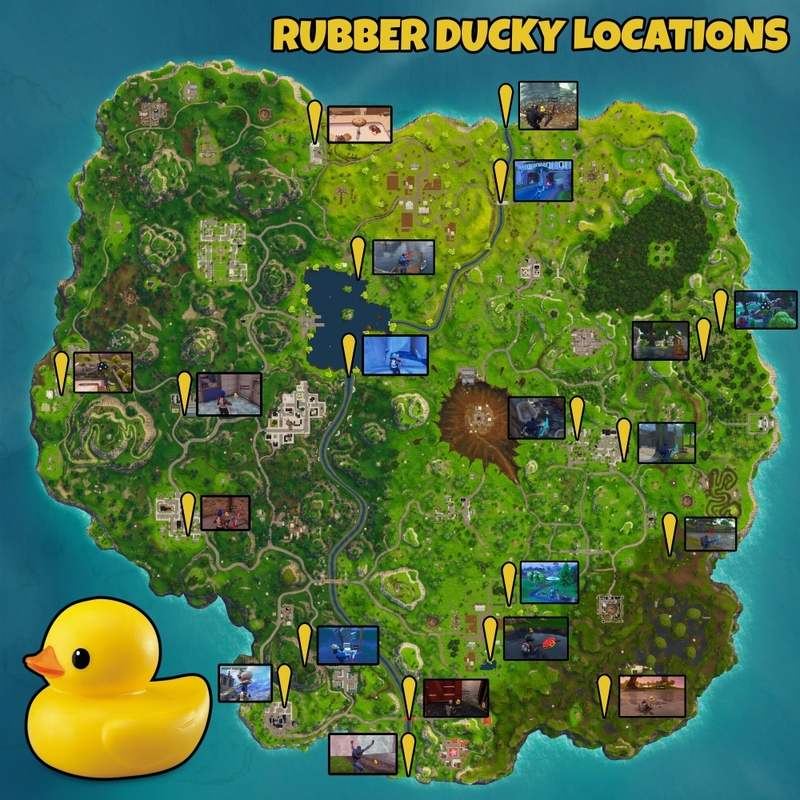 Editor's UPDATE: We've included another 9 Rubber Ducky locations to this page, with help from Fortnite's community members which we've credited down below. There's now a total of 19 Rubber Duckies in this guide, which is more than enough to complete this Week 3 Challenge! Our Week 3 Challenges guide has got you covered if you're struggling with any other tasks! Here’s a list of where you’ll find all the Rubber Duckies across the map. Don't make the mistake of running off without interacting with these Rubber Duckies - trust us, we've made the mistake before! North East of Anarchy Acres: Sitting on a platform below the waterfall. Between Anarchy Acres and Risky Reels: Under the bridge that runs between these two locations. Greasy Grove: Destroy the water tank on the South side. Fatal Fields #1: Found along the little stream to the North East. Fatal Fields #2: By the large pond to the South of this location. Near the tree. Flush Factory #1: Destroy the enormous toilet bowl to the North East of this location. Flush Factory #2: To the North of Flush Factory there's a enormous hill. The Rubber Ducky can be found by a small toilet along the path that runs across this hill. Between Junk Junction and Anarchy Acres: In the abandoned pool. Between Lucky Landing and Flush Factory: There's a bridge that runs between Lucky Landing and Flush Factory. You'll find the Rubber Ducky, resting underneath this bridge by the overturned ice cream truck. Lonely Lodge #1: By a cliff side, directly North of the "L" in "Lodge". Lonely Lodge #2: Near a lodge that towards the South West. Directly under the "N" in "Lonely". The Rubber Ducky will be along the stream by a rock. Loot Lake: Directly North of Loot Lake, next to one of the boats in the center of the pier. Lucky Landing: By the edge of the waterfall to the West of Lucky Landing. Retail Row #1: In the bathtub of one of the houses towards the North West. Just above the "T" in "Retail". Retail Row #2: At the South Easternmost point of Retail Row, sitting by the metal grated fence. Snobby Shores: In the pool. South of the Prison: Located directly South of the Prison, and South West of Moisty Mire. In a murky pool of water near the cliff edge. Between Tilted Towers and Snobby Shores: In the bottom left corner of the warehouse between these two locations. Tilted Towers: By the edge of the little waterfall to the North East of Tilted Towers. These Rubber Duckies make squeaking noises whenever they're nearby, so listen out for them if you're ever finding it difficult to locate them. On top of this, try and make a habit of checking your UI whenever you've interacted with one - just to be sure that it's registered. If you’re struggling to beat some of this week’s challenges, make sure you check out our Week 3 Challenges guide for tips on all the latest tasks, including the Salty Springs Treasure Map Location too! It's now an updated version of the map which contains 19 Rubber Duckies locations! Again, thanks to RiaNNNN_ for the map as it's the perfect tool to bring up on another screen while you're in-game! That’s all for the third iteration of our Rubber Duckies guide. We’ll update this page with more in-depth info as it swings our way - stay tuned!